Located in Oconto County, Wisconsin, this incredible 280-acre waterfront recreational property boasts nearly a mile of river frontage on the well-known Oconto River. "Oconto" in the native Algonquin language means "river of many fishes". For today’s modern angler, the Oconto River is still well known as a river of many bass, walleye, northern and panfish. With its tributaries reaching into Shawano, Marinette, Menominee, Langlade, and Forest counties, the North Branch of the Oconto River and the South Branch of the Oconto River combine at Suring, Wisconsin just a few miles upriver from the location of this property for sale. The Oconto River runs a length of over 50 miles from Suring before emptying into the waters of Green Bay at Oconto, Wisconsin. In addition to fishing, the Oconto River's many miles of largely undeveloped shores serve as a major wildlife corridor through the woodlands and farmlands of Oconto County. These undeveloped shores provide scenic beauty for canoers, kayakers, inner-tubers both on its long, lazy stretches and through occasional stretches of riffles and rapids. 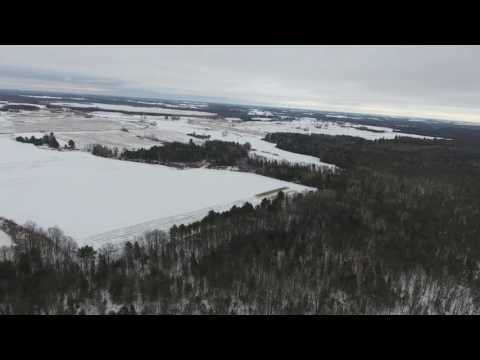 This amazing acreage is located west of Gillet, halfway between Cecil and Suring in Oconto County. Although one can find some incredible large tract acreages in far northern Wisconsin and the Upper Peninsula of Michigan, this is one rare opportunity to save the drive and own large acreage on water without a long, long drive. Whether by jeep, ATV, UTV or by walking, the many miles of trails miles meandering throughout the property allow ready access to explore all that this big acreage encompasses. From upland agricultural land to wooded hillsides to level river bottoms with creeks and ponding, the property offers interesting diversity in both its topography and its woodlands. About 30 acres of tillable acreage is ringed by woods consisting of Oak, Maple, Ash, Popple, Birch, Cedar, Hemlock, Red Pine and White Pine. One trail extends nearly the entire mile along the frontage on the Oconto River. At about the halfway point a small clearing and sandy beach area makes one think of Huck Finn and Tom Sawyer. There is not another home in site across the river. From the river trail, smaller trails branch off into the woods waiting to be explored. The ag land is yours to do with what you please. Whether leased to a local farmer or taking a turn at planting your own crop, there's income available to help pay the already low property taxes. Wildlife also find food and refuge in Wisconsin's fields and field/forest edges. An old farmhouse, barn and a couple of sheds serve as reminders that this property was once a real working farm. The farm house could be fixed up, or a new house could be built in any number of home sites on the property. In the meantime, there are are plenty of great camping sites along the Oconto River. Practical aspects of the property include Managed Forest Land (MFL) and Agricultural Use Value Assessments on most of the property. If you're not already familiar with these cost saving Wisconsin programs please don't hesitate to ask how they can help the next owner of this property keep their property taxes low and increase the investment value of the property. Electricity is on site at the house, and the property has year-round access off a quiet, paved country lane. A gate at the driveway provides extra seclusion when you at the property and security when you're away. The barn and sheds would be a suitable place to store your gear and toys: boats, canoes, ATV’s, UTV's, camper, and even that old Jeep, Bronco or Blazer you've always wanted to have as your "up north" truck. You'll enjoy years of exploration on your own private acreage, and for some time away from the property, Shawano Lake is only 20 miles away. Shawano Lake is one of northeastern Wisconsin's largest lakes and known for its fishing and boating. A 6215-acre lake located in Shawano County, it has a maximum depth of 39 feet and is known as an excellent fishery. Fish species include Musky, Panfish, Largemouth Bass, Northern Pike, Walleye and Sturgeon. A public park and beach is located on the north side of Shawano Lake; seven boat landings provide many choices for launching your boat. Brand new listing! Bookmark page and check back for new spring photos and additional maps; or, let me know you're interested in this new listing and I'll make sure you're among the first to get the new updated pics, maps and info.